1. he made me laugh until my head exploded in the car on the way home today. he was telling me that when his dad owned a bakery they got an 800 number, it was 1-888-4-DONUTS. i almost died laughing. i am still laughing as i think about it. 2 minutes later he says, "you better make sure that is actually true before you blog about it." that made me laugh even harder. 2. i was so nervous about going to the realtor's office today after work. i get really nervous about seeing people i don't know very well... nervous to the point of pit sweat, gas, and feeling like i might sargent. when i turned to my matthew to ask him if he was nervous, he replied. "no, i don't really get nervous since i met you. i used to be nervous all the time, but not anymore." "because i am so ultimate," i say with a sarcastic giggle. "yah, because i already got the prize, i already have you babe." cheesy yes. joking, yes a little. but i also knew he meant it. i hugged him in the parking lot, and felt a little less nervous myself. 3. he is always sensitive to the feelings of people around him. he wouldn't want to hurt any one's feelings, or offend anyone. when the realtor stepped out to pick something off the printer, i dug through my purse to get the information i printed about houses i liked. "melinda, you can't get that out here, put it away." he was afraid i would offend the realtor by bringing out my own printed pages of houses we liked. 4. i feel back asleep this morning, i slept the whole time he was in the shower. when he got out of the shower and came back to our room to find me still drooling on my pillow, he didn't even raise his voice. just told me nicely that i needed to wake up or we would be late. 5. because i was running late today, he tracked down my purse, my phone, the car keys, and got my breakfast and lunch ready for me. when i came barreling down the stairs there he was with all my goodies in hand, waiting for me patiently. 6. he tells me i am hott, even when i am not. even when i am fat as a cow, and haven't showered in 2 days. not that i am fat or dirty, but you know... if i was... he would still love me and tell me i am hott. he is the beast. i mean the best. sorry if this sight made you throw up a little in your mouth. picturing brett in purple kind of has that effect on people. we love brett around here. it still makes me gag a little. 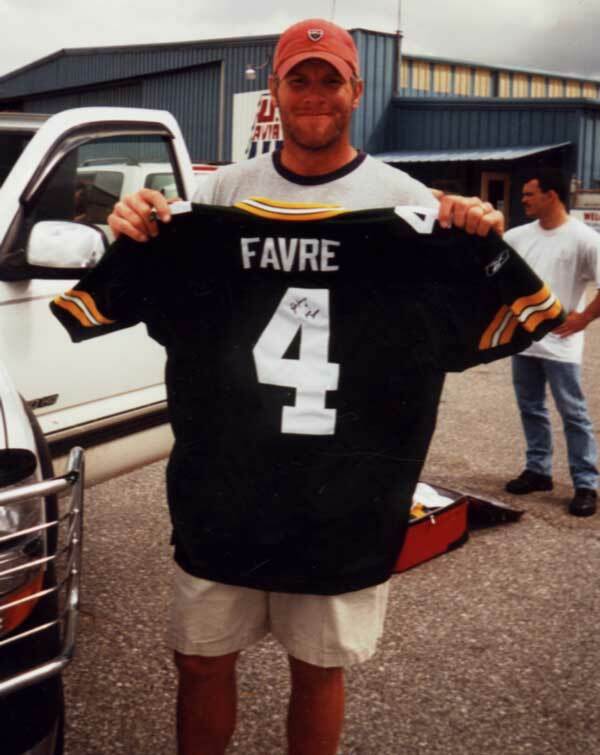 i will secretly be cheering for brett while wearing my packers garb. shhh... don't tell. cheering against the packers may be cause for my execution, or possibly end my marriage. I really love that you said sargent. Kacey and I were just talking about you last week and saying that we wished you were here so we could all hang out and play nubs. Speaking of nubs, I found a really hilarious and realistic looking nubs picture of us the other day. Miss you! love this post. i love seeing the little things about people that make them special. wish i was there to play nubs with you too... tell kacey hola. and i think i found that nubs picture the other day too. we are at the cabins? no one but you knew what that sargent meant. sargent... is the word i usually choose for throw up, vomit, puke, barf... you get the drift. since those other words actually make me physically sick to my stomach to say or hear them, i say sargent. me, and my couisn jennifer, and her friend kacey use it. it can be used as a verb or a noun. ie; i feel like i am going to sargent. or look at the baby with sargent on his shirt. now excuse me, i am feeling a little nauseaus. What a sweet post. His mama raised him right! I gota chuckel out of the 1-800-donuts! Too funny.